Success in the API economy can be ensured with a strategy that leverages APIs to exploit the value of your IT investments. New digital business services can be delivered faster and with less risk using APIs to transform existing applications into more engaging customer experiences. Get your complimentary copy of this Gartner research today. Want to learn more about using APIs to transform your green screens into web and mobile experiences that will delight your customers? Check the box on the form to request a call with a Rocket API expert. 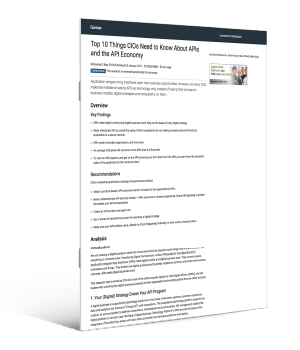 Gartner: Top 10 Things CIOs Need to Know About APIs and the API Economy: 2 May 2018 : Paolo Malinverno, Kristin Moyer, Mark O'Neill, Mike Gilpin GARTNER is a registered trademark and service mark of Gartner, Inc. and/or its affiliates in the U.S. and internationally, and is used herein with permission. All rights reserved. © 2018 Rocket Software. All Rights Reserved.